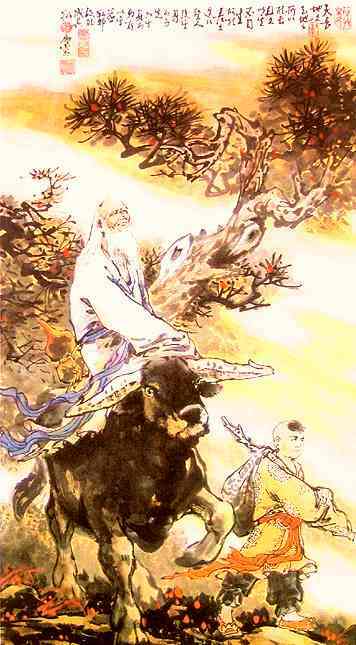 The Tao Te Ching or Daodejing, originally known as the eponymous Laozi or Lao tzu, is a Chinese classic text. Its name comes from the opening words of its two sections: dào "way,", and dé "virtue," plus jing "classic." According to tradition, it was written around the 6th century BCE by the Taoist sage Laozi (or Lao Tzu, "Old Master"), a record-keeper at the Zhou Dynasty court, by whose name the text is known in China. The text's true authorship and date of composition or compilation are still debated. The Tao Te Ching is fundamental to the Taoist school (Dàojia) of Chinese philosophy and strongly influenced other schools, such as Legalism and Neo-Confucianism. This ancient book is also central in Chinese religion, not only for Taoism (Dàojiao) but Chinese Buddhism, which when first introduced into China was largely interpreted through the use of Taoist words and concepts. Many Chinese artists, including poets, painters, calligraphers, and even gardeners have used the Tao Te Ching as a source of inspiration. Its influence has also spread widely outside East Asia, aided by hundreds of translations into Western languages. The Wade-Giles romanization Tao Te Ching dates back to early English transliterations in the late 19th century, and many people continue using it, especially for words and phrases that have become well-established in English. The pinyin romanization Daodejing originated in the late 20th century, and this romanization is becoming increasingly popular, having been adopted as the official system by the Chinese government. See discussion at Daoism-Taoism romanization issue.